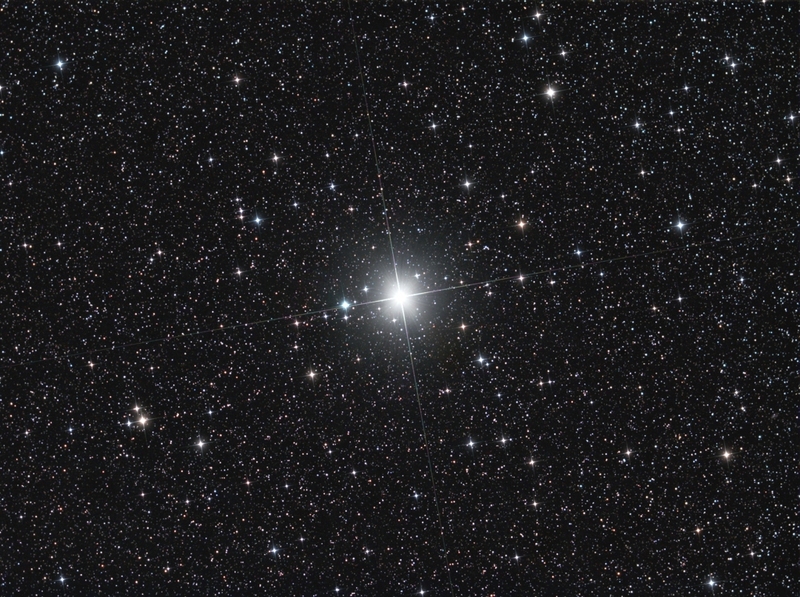 I have gone for one of my “single bright star” images for this Month’s “Image of the Month”. This Month’s object is the star Procyon or 10-Alpha Canis Minoris in the constellation Canis Minor. 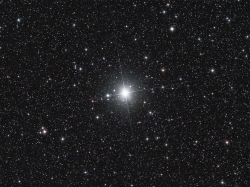 Procyon shines brightly in this region of sky at magnitude 0.40 and part of the reason it is so bright is that it is very close to us at just 11.41 light years. With an F5IV-V spectrum, Procyon appears bright white in the sky, and also in this image. You don’t need very long subs when imaging bright stars, but if you want to capture a decent number of background stars you need to use subs from 3-5 minutes long. In order to reduce the noise it is a good idea to get at least a couple of hours of total exposure time, though if conditions are favourable you will get a good result with just an hour or so. As this image was taken with the Sky 90 refractor it is clear that the spikes are “software spikes”. When a single star is the subject of the image I prefer to see some spikes rather than a bright ball of light with an extended fuzzy outline – but that is just personal preference. There are some cases (M44 immediately comes to mind) when I prefer no spikes at all, it depends a great deal on the subject and its setting. There isn’t much apart from Procyon in this region so this one is a case of all or nothing, only really worth taking if you are building up a portfolio of the brightest stars in the sky.